Choose something both refined and sensible (almost), from $70 per day or less. 4 doors. 4 seats. A decent sized boot. A fixed roof that doesn’t move. Italian engines that definitely do move the rest of the car in a very visceral, pleasing, and executive express way. What are we thinking? A saloon car that seats 4 adults and a decent amount of luggage? Have we gone all sensible and middle aged? Well yes….and no. For those who prefer to proceed in a fashion no less briskly and entertaining than the rest of our fleet but a lot more discreetly with a lot more space, this is the car for you. It’s gun metal grey paintwork signals sharp suited styling. But don’t think its 4 doors and a boot equate to an ordinary 4 seater rental saloon…. We don’t do ordinary at RentAClassic. This is sharp styling with sharp handling wrapped in superb comfort. The V6 3.0 engine is silky smooth, but can be easily worked up to a rasping howl very quickly with in automatic or clutchless manual gearchange….up to legal speed limits of course. It can cover very large distances with effortless ease, but still have people asking you what is that characterful car you’ve got…..just another 4 door rental saloon, not. Being a wolf in sheeps clothing and reining it in probably. You’d think it might feel flimsy and insubstantial but whilst the steering is light and responsive, the car itself feels seriously reassuringly solid and planted on the road. Otherwise it’s all a perfectly normal car with hardly any Alfa idiosyncrasies, apart from the usual one of the lock to access the boot hidden under the rear Alfa badge. But it’s even got a boot release lever sensibly positioned by the drivers seat along with one for the fuel cap for goodness sake. Yes it is an Alfa Romeo and this one is regularly serviced and has to pass the Certificate of Fitness (CoF) test required for all rental cars every 6 months. You have ABS brakes, driver and passenger airbags, high level brake light and side impact bars, along with very predictable and sure footed handling. Really good. Everything works as it should and it’s very smartly presented inside and out, especially the woodgrain central console with electronic command centre. The boot can swallow a lot, including a full size solid suitcase and lots of bags. Plus if you’re only two up there’s a lot of extra space on the back seats. For exact dimensions, refer to the Seating & Luggage tab above. 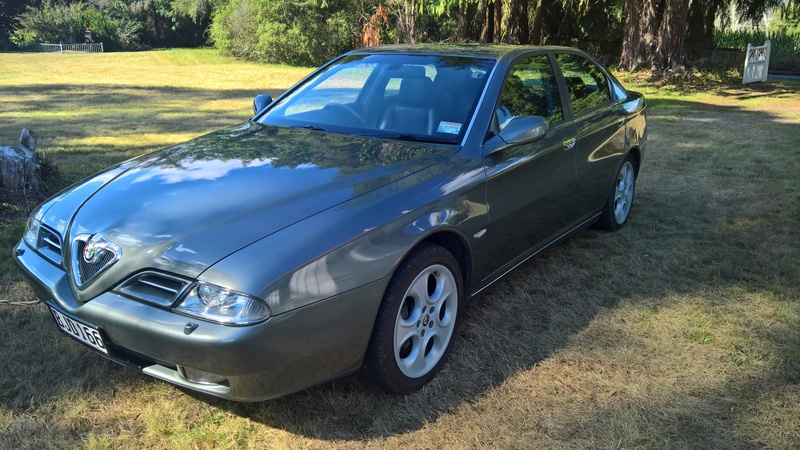 And the RentAClassic description for the Alfa Romeo 166 V6 Saloon? Far superior to most phone apps, with HD dashcam option to record your epic drive! $15/25 per 24 hours.